Managing departments is an important aspect of daily Octopus use. Departments are found in requests, the user files, the CI files; in other words, they are everywhere and critical to the use of Octopus. We find in this article the explanation of the different fields and terms used to represent each level of departments and how to find the information of these through the application. This section is for Octopus administrators with access to Tools > Reference data management. Note that in an environment with multiple Octopus teams, people from the IT department will normally be the ones that will have the rights to modify the departmental structure. The Modify common team data permission is required for these modifications. It's important to note that if synchronizations or imports are made with ADSIReader or DataImporter, new departments will be created automatically if Octopus does not find the same name unless the synchronization is based on the department number. With time, departments in a company can change. To see, add or modify Octopus departments, go to Tools > Reference data management > General > Departments. If it is active or not. This field is optional. It can be used to synchronize the departments from an external source using DataImporter. The department can then be synchronized using the number to update the name of the department if it changes at the source. This field is optional. It is used for automated hierarchical type approvals. A note for the department. This field is optional. It can be used to appear in a list or in search criteria. If a department has been created by mistake or if modifications are done in the company department structure, Octopus allows merging a department into another. 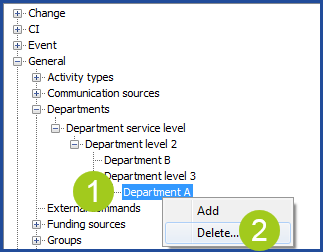 Place the cursor where the department or sub-department needs to be added. Right click and click on Add. The name can be modified later. 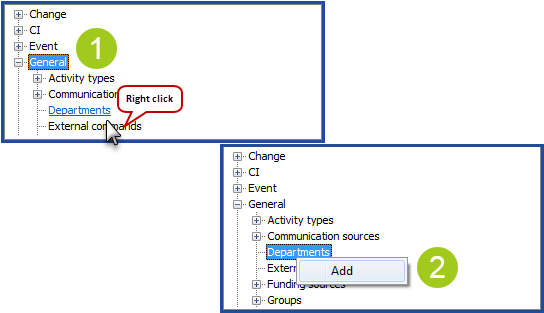 To modify click directly in the field. The number can be added or modified later. Activate or deactivate the department. By default, the department will be active at the creation. The manager name can be added or modified later. The note can be added or modified later. Save at the top left. Take note that the next three actions should not be done lightly, as they involve risks. In addition, if there is more than one team in Octopus, these actions affect them all. The amount of data to merge or move determines how long the action will take and could significantly slow down Octopus. We recommend doing this type of action outside normal business hours. If there are duplicate departments, they can be merged into one. But, if the duplication problem comes from an automated synchronization, the situation must first be corrected at the source. Before proceeding, note that this action cannot be reversed! Select the department that will be absorbed into another. Note that merging can only be done from the last department level. If you try to merge a department that has another bellow it, a warning message will appear. A message advising you that this should be performed during off hours will appear. A confirmation message advising that this action affects all teams in Octopus will appear. Select the department to merge into. 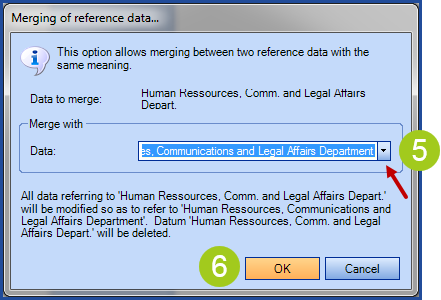 If you try to merge a department that has one or more sub-departments, this warning message will appear. 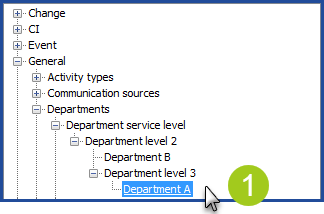 Select the department and slide it where it needs to be in the structure. Release the mouse to complete the move. A message will appear to ask for confirmation and advise that this affects all teams and may take a while to complete. Select the department to delete. A message will ask to confirm. An error message will appear on the screen if you try to delete a department that is used in a CI, a user file or other. It is possible to deactivate the department in this case. It is possible to import departments and sub-departments from AD. For more information on how this works, consult the ADSIReader - Integration to Active Directory article. DataImporter allows importing departments and sub-departments. For more information, consult the DataImporter - Import departments article. 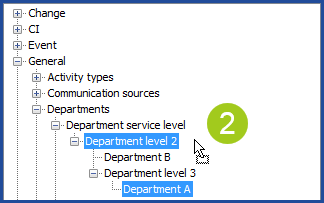 During the configuration of Octopus, the department levels required to properly support the structure of the departmental hierarchy can be added. Represents the first department from which your department tree begins. This is the highest possible department of the structure. From a target department, represents the levels above. From a target department, represents all sub-levels to get to the target department, including this one, but excluding the root department. 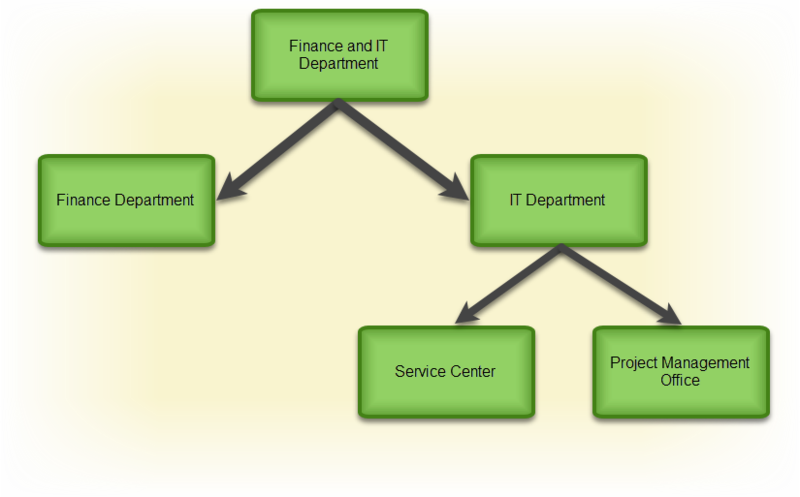 Represents the department in its structure of your element (CI, user, request, etc. ), including all its levels, as the root, parents, and sub-departments. In this example, we will see the departments and sub-departments that will represent the main department, service, and sub-services in a case where a customer wants to see a list of the users that are part of the Project Management Office. For this, one of the main departments (root department) will be the Finance and IT Department, followed by a sub-department (second level) of the IT Department, that in turn will have the Service Center and Project Management Office under it (third level). Add the Root Department column. Add the Parent Department column. The Full Name field will show the same information as the Department field. As they both give the same information, select the one that is more convenient. Even if the explications above are described for columns, the same logic also applies to advance searches.